My heart is instructed to speak daily the Apostle Paul’s prayer for his beloved Church of the Thessalonians through Advent 2017— on behalf of my children and my children’s children. Will you join me? We cannot fathom the benefit of such solidarity in prayer to Almighty God for a faith legacy in our ensuing generations. May it be a prayer heard ‘round the world! Meanwhile, I pray for YOU this Advent season— to be fully engaged with the ONE who has been sent and to fully hope in the ONE who will come once more! One of these things is not like the other! 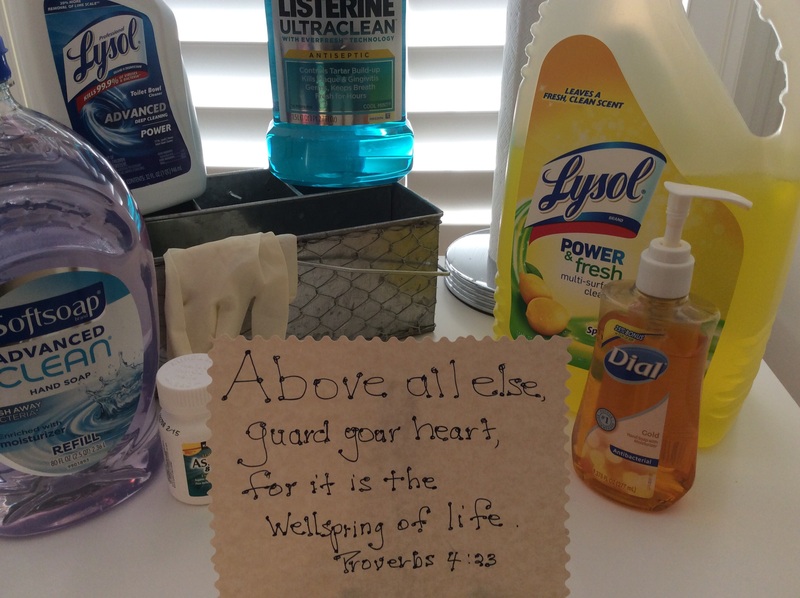 The products in this picture guard against germs and threats to our health and well-being. Advertising and marketing campaigns, news reports and word of mouth advice encourage us to be proactive in our fight against harm to our homes, possessions, and bodies. In Proverbs 4:23 King Solomon imparts the wisdom of applying a protective guard for the sake of our hearts. Above all else, guard your heart for it is the wellspring of life. This Bible verse urges us to make guarding our hearts a priority because everything we are and do flows from the heart. The robe that Hannah fashioned for Samuel was a priestly robe. (A Robe for Samuel--April 07, 2015) Samuel donned his robe to carry out his priestly duties. The robe set Samuel apart as a priest of the Lord. Samuel’s Growing Robe framed his behavior. We want to impress on our children the value of guarding their hearts since their conduct before God is at stake. The conduct of the faith community matters to God because our conduct reveals how much God matters to us. In his letter to the believers in Philippi, the Apostle Paul advised them concerning their conduct. Whatever happens, conduct yourselves in a manner worthy of the gospel of Christ. (Philippians 1:27). Understanding the relationship between the condition of their heart and the resulting conduct is life-long. I am living proof of that! Here are some “On Guard” principles to encourage your children in their pursuit of conduct worthy of the gospel. The products in the picture came from my own shelves. I do not minimize the need for practical guards for the sake of safety and disease prevention. Ultimately, however, we are eternal beings and God is our shield. God makes protecting our hearts a priority. Let’s follow His lead and train up a generation who are bent on protecting their hearts from the wiles of the world. Indeed, out of our hearts our conduct flows. OPP (opportunity for action): Begin to sew (sow) Proverbs 4:23 into your child’s Growing Robe. Grab your closest bottle of hand sanitizer and say to your child or grandchild, “ You know, God wants our hearts to be clean too.” You can take it from there, Mom.